The melt is on! Over the last few weeks, daytime temperatures have been trending upwards, getting rid of the snow to reveal the barren shrubs and mounds of dead grass accumulated over the winter. But as humans—as well as long-buried garbage—begin to reappear on the streets, so do other natural phenomena: springtime illnesses. It is true that cold and flu season is almost in the rearview mirror. Although you can catch either ailment year-round, colds and flu are definitely more widespread from October to May. 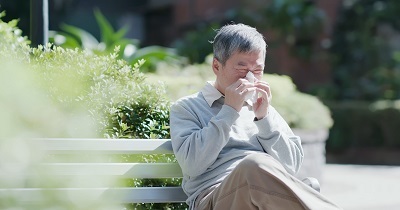 The most common spring sicknesses typically involve the respiratory system: seasonal allergies and asthma pick up, as do some other less common spring ailments, like reverse SAD. The truth is that I’m no fan of spring, but at the risk of being a killjoy, here are five illnesses you should be aware of that hit a little harder this time of year, or linger from winter. When plants start to bloom and their pollen is moving around, seasonal allergies pounce on sufferers. Often confused for a cold, the congestion, runny noses, watery eyes, and sneezing can really put a damper on your day. Speaking of dampers, seasonal allergies can also be worsened by mold growth, as the excess moisture from melting snow and spring showers provide an opportunity for fungi to fester. Allergies are basically the result of an immune system that is working a little too hard. The body’s natural line of defense goes after harmless substances—like pollen from grass, trees, and weeds—in your nose, lungs, and eyes. When a person with allergies comes into contact with an allergen, it releases chemicals called histamines that lead to swelling and inflammation. If you have spring allergies, there likely isn’t much you can do to get rid of them. Sometimes they will go away on their own, but if not, you will need to focus on ways to relieve the symptoms. Allergic asthma affects roughly 50% of adults with asthma and as many as 90% of children with asthma. This form of asthma can flare up in the spring as certain allergens increase in prominence, resulting in extra sensitivity within the body’s airways. The muscles in the airways tighten up, become inflamed, and can flood your system with thick mucus. Springtime seasonal allergic asthma is triggered by pollen from tress, grass, and flowers, and mold. Some ways to reduce the risk for an allergic asthma attack include staying indoors when pollen counts are high, using a dehumidifier or air conditioner to slow the growth of mold (keeping humidity under 40%), and wearing a HEPA-filter mask when doing yard work. Viruses from the winter months can sometimes remain active and expose certain groups to an increased risk—like the stomach flu for college students coming together in close quarters to write exams. But in many cases, what seems like a stomach flu—especially in spring or summer—actually is gastroenteritis. Gastroenteritis is an inflammation of the intestines that can result in diarrhea, abdominal cramps, nausea, and a lost appetite. Most commonly, it is the result of a viral or bacterial infection. Viral gastroenteritis is highly contagious and usually spread between people through unwashed hands or the sharing of food, drink, or utensils with an infected person. It can also be spread from contact with surfaces, and those that are more often used in the spring or summer—public campground facilities, public outdoor washrooms, and other shared spaces—may elevate the risk. Coming into contact with bacteria like salmonella or E. coli can cause bacterial gastroenteritis. Springtime may boost the risk as warmer temperatures encourage bacteria growth in improperly cooled or stored food, leading to infection upon consumption or contact. Eating food at picnics and barbecues can raise your chances of infection, as can swimming in certain lakes and streams. If you are experiencing stomach flu symptoms, go see your doctor. Unfortunately, the infection will have to run its course and usually lasts for a few days. You can help yourself by getting rest, drinking plenty of fluids, and eating easy-to-digest foods like soup and gelatin before moving on to heavier items like rice. Strep throat is caused by exposure to streptococcal bacteria. Like colds and flu, it can strike at any time during the year but is most common during the fall-spring stretch. It is highly contagious and is usually transmitted between individuals by direct contact or breathing in infected water droplets from sneezing or coughing. It can also be transmitted by sharing food and utensils, or by touching objects handled by an infected person. Because strep throat is a bacterial infection, it is best treated with prescription antibiotics. Certain foods like garlic, Manuka honey, onions, and cinnamon are sometimes used for their antibiotic properties, but often are not potent enough to effectively treat strep throat. Therefore, natural treatments will center largely around reducing throat pain while prescription antibiotics attack the bacteria. Seasonal Affective Disorder (SAD) most commonly affects people in the fall and winter, but spring and summer can also bring on the blues. Roughly 10% of people with SAD experience depressive symptoms with the longer, brighter days, which is referred to as reverse SAD. Keeping up with exercise—regular activity can help keep depressive symptoms at bay. If crowded streets give you anxiety, go for walks in the morning or evening or find low-key parks or trails close by. As the shrubs and flowers bloom for spring, so does your susceptibility to certain illnesses. Pay attention to your outdoor surroundings, eating habits, mood, behavior, and hygiene this season to limit your chances of getting sick. If you do acquire any of the above seasonal ailments, consider a natural method of managing and/or treating the condition. Lewis, S., “5 Most Common Spring Ailments” Healthgrades, May 4, 2017; https://www.healthgrades.com/conditions/5-most-common-spring-ailments, last accessed March 26, 2019. Frothingham, S., “15 Home Remedies for Allergies” Healthline, July 11, 2018; https://www.healthline.com/health/home-remedies-for-allergies, last accessed March 26, 2019. DerSarkissian, C., “Allergic Asthma” Web MD, August 6, 2017; https://www.webmd.com/asthma/guide/allergic-asthma#2, last accessed March 26, 2019. Ratini, M., “Is There a Natural Cure for Asthma?” Web MD, October 2, 2018; https://www.webmd.com/asthma/guide/natural-cure-asthma, last accessed March 26, 2019. “Gastroenteritis in Adults,” Harvard Medical School, May 2017; https://www.health.harvard.edu/a_to_z/gastroenteritis-in-adults-a-to-z, last accessed March 26, 2019. Nail, R., “How to recognize strep throat” Medical News Today, December 22, 2017; https://www.medicalnewstoday.com/articles/312433.php, last accessed March 26, 2019. Spritzler, F., “15 natural remedies for a sore throat” Medical News Today, August 1, 2017; https://www.medicalnewstoday.com/articles/318631.php, last accessed March 26, 2019. Griffin, M, “Tips for Summer Depression” Web MD, February 9, 2017; https://www.webmd.com/depression/summer-depression#1, last accessed March 26, 2019. Andrews, L., “When Spring Brings You Down,” Psychology Today, March 28 2012; https://www.psychologytoday.com/us/blog/minding-the-body/201203/when-spring-brings-you-down, last accessed March 26, 2019.